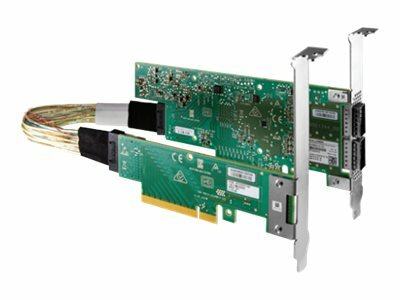 Intelligent ConnectX-5 adapter cards introduce an acceleration engines for maximizing High Performance, Web 2.0, Cloud, Data Analytics and Storage platforms. ConnectX-5 with Virtual Protocol Interconnect supports two ports of 100 Gb/s InfiniBand and Ethernet connectivity, sub-600 nanosecond latency, and very high message rate, plus PCIe switch and NVMe over Fabric offloads, providing extremely high performance and really flexible solution for even demanding applications and markets. ConnectX-5 enables higher HPC performance with its Message Passing Interface (MPI) offloads, such as MPI Tag Matching and MPI AlltoAll operations, advanced dynamic routing, and great capabilities to perform various data algorithms. Moreover, ConnectX-5 Accelerated Switching and Packet Processing (ASAP2) technology enhances offloading of virtual switches, for example, Open V-Switch (OVS), which results in significantly higher data transfer performance without overloading the CPU.